It is that time of year again! Come out Saturday, September 21st (2019), for a free day of fun, friends and food. 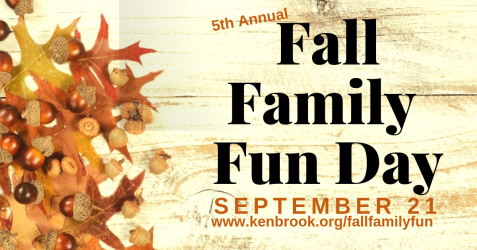 Beginning at 10:00am and going to 3:00pm, you will be able to experience the fall season at Kenbrook. Bring your friends and family to participate in our many activity areas. We cannot wait to see you! For more information please contact us at (717) 865-4547 or . To RSVP simply click here and add your name. This is a great family friendly day for you to relax and enjoy but it is also a great introduction to Kenbrook as a possible summer time activity for your children!